Barcelona defender Samuel Umtiti is reportedly making good progress as he receives treatment on his knee injury, but fears still remain over surgery. The 25-year-old has been limited to just one appearance in the Champions League all season due to his knee problem, while he has featured in just one of the last nine La Liga outings for the Catalan giants. With the troublesome injury continuing to bother him, AS note that he was sent to Doha to continue treatment earlier this month, and that in turn is working well to this point as it’s claimed that there is optimism ahead of his return to the Barcelona training ground on December 30. However, a final decision has yet to be made on whether or not he’ll need to undergo surgery, as ultimately it will all depend on whether or not he continues to make a full recovery without suffering any setbacks or raising any fresh concerns over a possible long-term complication. In turn, the report adds that should it eventually be forced upon Umtiti and Barcelona to undergo a procedure, it essentially is likely to rule him out of action for the rest of the season. That will undoubtedly complicate matters for the reigning Spanish champions, as coach Ernesto Valverde is only able to call upon Gerard Pique, Clement Lenglet and Thomas Vermaelen as his experienced centre-half options currently. 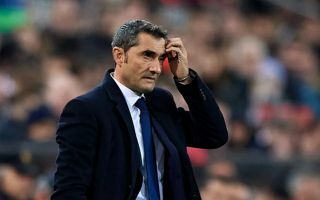 With Barcelona looking to compete on multiple fronts moving forward into the second half of the campaign, having just three options in such a crucial department is surely taking a serious risk. In an ideal world for the Catalan giants, they’ll get Umtiti back at the start of 2019. However, the report clearly suggests that there is a genuine concern still about the ongoing threat of surgery looming over them, regardless of the fact that the signs so far are positive.